Horroshow (Solo & Adit) are preparing to drop their sophmore album Inside Story this Friday on October 2nd via Elefant Traks. Judging by the tracks which you can catch over at MySpace, this album is just exactly what we’ve come to expect from the Horrorshow crew after the auditory awesome that was The Grey Space. If anyones to thank for making things sound different in Aussie Hip Hop this year, it’s the Elefant Traks camp, so don’t sleep on their releases this year. You can also check out their single Thoughtchrime (Doin’ My Think) online now. 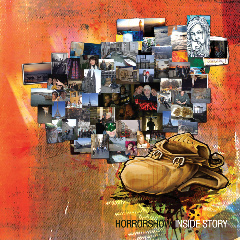 Introducing one of the most rewarding hip hop listens of 2009, Horrorshow’s Inside Story. Horrorshow bring the energetic optimism and anxiousness of post-school pre-mortgage times to life, with vividly true poetics. The coming to terms with what will ultimately be lifelong memories: from overseas travel and the perspective it provides; to self-realisation and adulthood. The lyrical and musical sophistication defy their youthfulness – but they play it humble – avoiding pretentiousness. Let’s not get too philosophical on it – Inside Story is hip hop to its bones: but Solo holds notes as comfortably as rhyme flows, and Adit’s production is deep, with lush strings and evocative samples painting the picture. In a short 18 months they’ve built up a loyal and expanding fanbase – playing Sydney Big Day Out, Groovin the Moo festivals, national tours with Hermitude and Muph & Plutonic as well as taking out Best Album for The Grey Space in Ozhiphop.com’s 2008 awards. They speak directly to young people, but with a mature outlook that has earned the respect of older heads. Once again, extended ‘One Dayers’ crew Spit Syndicate guest on one track while The Herd’s Jane Tyrrell drops a sweet duet with Solo on another. Inside Story is the album that positions Horrorshow as one of the picks of a very talented new crop. If you want to get your pre-order on you can do that over at JBHifi now. Update: You can now also grab Horrorshow’s new album Inside Story from iTunes.